Do you have the mindset of prosperity? Today's guest, Weldon Long does! Listen as he tells the amazing story of his journey from prison, to a homeless shelter, to top salesperson, speaker and best-selling author. His mindset allowed him to thrive in the face of adversity and prosper in the face of many challenges. I highly recommend the prosperity mindset philosophy and the business training it has spawned over the years. It's all about tuning your thoughts and gearing your mind for success so that no obstacle, struggle or fear can stand in your way. It led Weldon to massive success and it has the potential to help you too. 05:45 - How sales saved Weldon's life. 07:43 - From prison, to the homeless shelter, to salesman. 12:48 - "We attract that which we fear." 16:01 - How can a thought show up in your life? 19:58 - You don't have to believe everything you think. 26:19 - The most important pieces of the sales process. 30:41 - Do you even know what you really want? 34:33 - What does sports have to do with sales? 40:22 - The implementation problem. 44:07 - The power of responsibility. 46:57 - Be aware of the role you play. 50:27 - Peeling the onion. 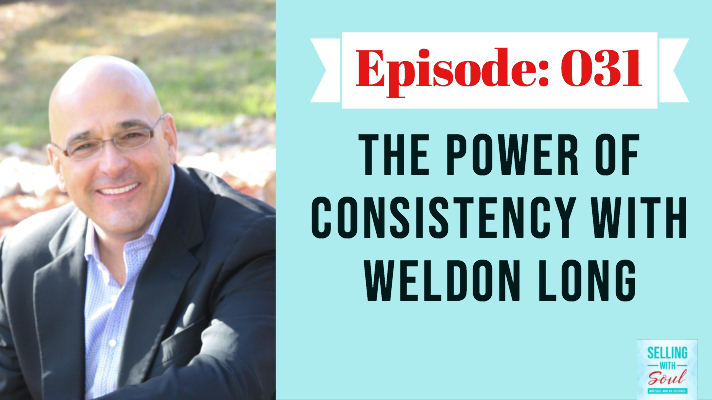 Weldon is a successful entrepreneur, a sales expert and author of New York Times best selling book, The Power of Consistency. He is one of the nation's most powerful speakers and super driven motivator who teaches the sales and prosperity mindset philosophies that catapulted him from desperation and poverty to a life of wealth and prosperity. You've had some great meetings, maybe even delivered a killer proposal. Things are going great with your prospect and you just KNOW that they are a perfect fit for your offering. Then things go silent. Your emails go unanswered. Your calls go unreturned. You've been ghosted and you cant understand why. 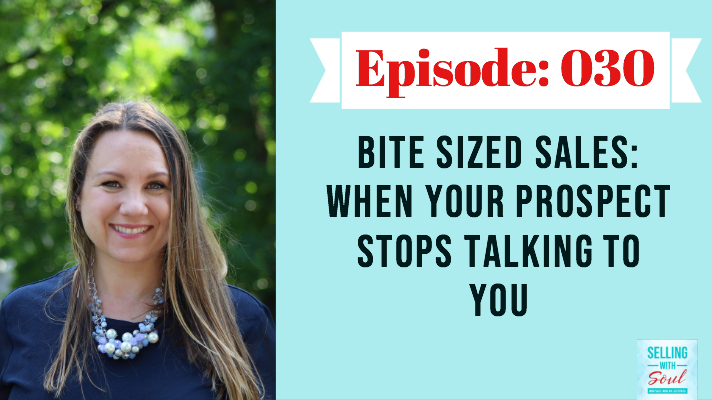 In this episode of Bite Sized Sales I give you a simple strategy to try to get back in front of your prospect and some potential reasons for the silence. I encourage you to listen to Episode #4: How To Prevent Buyer Pricing Concerns as it will help you understand how to avoid being "ghosted" going forward. Prospecting, networking, relationship building, relationship management, closing...the sales process is full of areas we're all looking to master to keep our pipeline flowing. But why does closing seem like the most problematic area for so many of us? 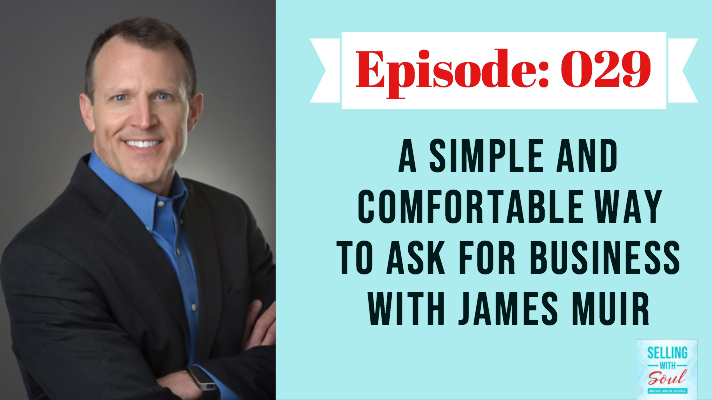 Today we're welcoming to the podcast, James Muir bestselling author, sales expert, extraordinary keynote speaker. In his book "The Perfect Close" he provides an approach to advancing the sale to the finish line that isn't uncomfortable and leaves both parties in better places than they started. His approach to not only closing but the entire sales process is motivational, inspirational and everything that we're about here on Selling with Soul. 4:48 - Is closing the most problematic part of sales? 8:18 - Does closing have to be an uncomfortable word? 11:58 - "The Perfect Close" is not a technique. Remember playing hide and seek as a kid? Come out, come out, wherever you are! Are you easy to find or do prospects have to search to find you? You won't be invisible anymore after listening to today's episode. Selling today is all about social and it's not just who you know, but who knows you. You know you need to get out there but do you not want to do it or do you not know how? Visibility is critical to growing your business and Meredith has a four-step plan to increase your visibility and increase your sales. There is a FREE download that accompanies this masterclass, be sure to grab that here. Are you an entrepreneur, small business owner or leader looking for more advanced, one-on-one help generating revenue? Click for more information about my Sales Intensive Coaching Program and let’s exceed your next revenue goal! 04:37 - If you build it or you have it, they will not automatically come. 08:25 - Who is your Avatar? 13:14 - Step 2. You're giving it (value) away for free? 16:08 - Step 3. The four most impactful things you can do quickly to get visible. 20:15 - Becoming part of your Avatar's community - the power of the pancake breakfast! 24:05 - Why Meredith uses circle drawings. 26:57 - Step 4 - Nurturing those relationships. 29:02 - Collecting contact info. 32:46 - Meredith's simple way of re-engaging. 37:01 - Powerful strategy of staying top of mind. Don't forget about your free download, The Completer Avatar Worksheet. Its guaranteed to make your sales and marketing a lot less stressful. Stories have incredible power. They can inspire change, they can start movements, they can even help us sell. Your story is one that NEEDS to be told. As leaders and sales professionals we are good at telling our company's and our product's story. We know them inside out and backwards. But do you know your own story and how that positions you to sell more and grow your business? Here’s why you need one and what it can do for you. What do high-performing sales cultures look like? What are some of the tangible elements that you can pick out in organizations that are truly sales oriented? 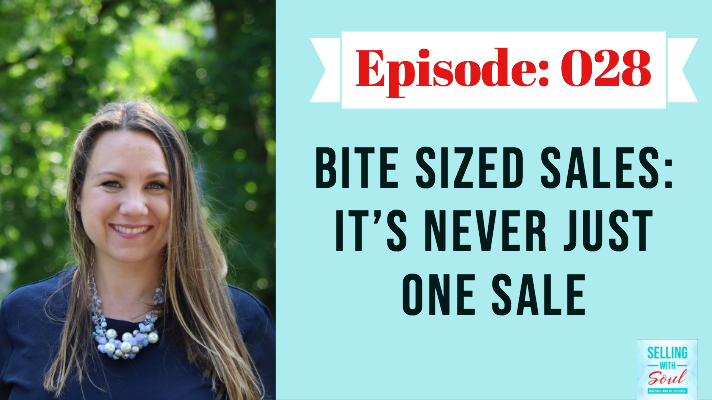 We look at three of the most important traits successful sales organizations posses in this edition of Bite Sized Sales. This episode is the second part of a two part series focused on developing high-performing sales cultures. In the first part of this series I reveal the two cornerstones that all successful sales cultures are built on. Looking for more on how to transition your culture to a “sales oriented one”? I led a free webinar on this topic that you’ll find valuable, you can check it out here. Finding the motivation to prospect for another hour, build a customer relationship and drive more sales into your business will NOT just happen. Self-motivation is an active process that tests your selling soul. Meredith was recently on an episode of Monday Motivation on the Sell or Die podcast with Jeffrey Gitomer and Jennifer Gluckow. They discuss prospecting, "Soul Selling" and how to stay motivated and focused through the week, month and year. Oh, and also 90's hip hop music. What technology and tech strategies could you be using in your sales workflow right now that could fill your pipeline and double your income? That's the question we discuss with my guest today, sales and technology expert Miles Austin. Miles is "The Web Tools Guy," founder of Fill The Funnel Inc., and a professional sales and marketing speaker and trainer. Today we're discussing the latest tech and tools you can use to "attack the tedious" and free up more time to build customer relationships that will net you more revenue. Are you an entrepreneur, small business owner or leader looking for more advanced, one-on-one help generating revenue? Click for more information about my Revenue Intensive Program and let’s exceed your next revenue goal. 3:25 - Let's celebrate a Selling With Soul milestone! 12:00 - Where and how should people start to leverage technology to make more sales? 22:48 - "I have a phenomenal ability today to get one message to as many people as I have in my CRM"
30:19 - Does technology hurt relationship selling? How do you develop the foundation for a high-performing sales culture? It starts with these two things ... simple and powerful but not easy. In today’s special edition of Bite Sized Sales, I share what I have found is the necessary foundation for building a high performing sales culture. I talk about why a consistent dialogue between your company and your current clients is the key to sales success and how your sales culture extends well beyond your sales team. I also share the details of a free webinar where you can get actionable advice on building your sales culture – attend live on January 15th or on-demand. Check it out here. Do you talk to yourself? It's not a sign that you're crazy. Everyone does it everyday. But HOW we talk to ourselves could signal something is amiss with our mindset and self-belief. Mindset is one of, if not the, biggest factor in your sales and your success. My guest today Natalie Eckdahl, author of R.E.S.E.T Your Mindset: Silence Your Inner Mean Girl, founder of the BizChix Community for women entrepreneurs and host of the BizChix Podcast. She says that we all have an "inner mean girl" or "inner mean boy" that voices our doubt and floods our mindset with negativity. Natalie is here to help us strategically deny these voices the power they need and change our mindset to work for us. Natalie will also share with us some of the inner mean girl thoughts that plague our inner dialogue, fill us with self-doubt and suppress our revenue potential. Ask yourself as you listen if you've ever had some of these thoughts. Follow Natalie on Facebook and Instagram for more strategies to maintain a positive mindset. This is a masterclass style episode - we will go DEEP into the framework for a great discovery call. I reveal my 4 keys to 10x-ing your discovery calls, we will uncover how structuring your meeting can lead you to actually have to sell less and we dive head first into questions. When it first aired, this episode was the second part in our series “Discovery Meetings That Deliver” a whole series dedicated to giving you absolutely everything that you need to lead sales and discovery meetings that deliver value and respect to your potential buyer and dramatically increase your likelihood of you gaining a new client. 11:03 - Why should I be using discovery calls? This podcast is part of the Sell or Die Podcast Network. Click on the links below to subscribe to more podcasts that you can take into the street and turn into money. How much power lies in a simple introduction? My guest today, Joanne Black, founder of No More Cold Calling, is a pioneer in and an advocate of building your sales pipeline through the power of referrals. It starts with building real human connections and relationships and ends with you getting past gatekeepers and into C-Suites with ease. Joanne is the author of two books, Pick Up the Damn Phoneand No More Cold Calling. She believes that referral selling is the fastest way to grow your revenue and today she's sharing all of her secrets, strategies and insight into getting someone to vouch for you. Are you an entrepreneur, small business owner or leader looking for more advanced, one-on-one help generating revenue? Click for more information about my Revenue Accelerator Sessionsand let’s exceed your next revenue goal. 4:52 - How powerful is an introduction? 8:00 - "We only put on LinkedIn what we want people to see." 39:45 - What if referral networking hasn't worked for me in the past? If you like what you hear, subscribe rate and review on Apple Podcasts, Stitcheror Google Playand share with a friend. Is there a particular topic, challenge or expert view that you would like to see featured here on the Selling With Soulpodcast? Email me at Meredith@MeredithMessenger.comand be part of our show! It's time to talk about your sales process. Is it helping you or hurting you? Does it even exist? My guest today is Jeff Bajorek, co-host of the The Why and the Buy podcast and author of "The Five Forgotten Fundamentals of Prospecting." He's here to share the method that helped him simplify his sales process down to four pieces that effectively generated more revenue for his business. 35:46 - Keeping Your Swagger: Do you believe you have value to buy? 54:52 - How are we supposed to know if our process is broken? Selling With Soul has a BIG announcement! We have joined the Sell or Die Network! Today I FINALLY got tell you all about the network, why we joined and what this means for you. Prospecting is proactively pursuing prospects that can and will buy from you and ones that you actually want to work with. The key word in all of this is proactively. You will likely never be able to see the momentum in your business that you're looking for if you are not actively putting yourself out there and creating opportunities for that revenue to come to you. Today I will reveal and discuss the top prospecting mistakes I see in my work with sales teams across the AND how you can fix them. Make sure to take notes and listen again if you need to because this episode is full of information you can use to generate more business...right...now. 1:31 - What is the real definition of "prospecting?" 12:28 - What is your prospecting plan? 24:47 - Do you have good prospect timing? 32:20 - Is there such a thing as too much communication? 36:40 - If you're not tracking, you can't do testing. 39:20 - Make today's prospecting efforts a little bit better than yesterday's and you will see results.